Raleigh - I Say Ding Dong Shop - Buy Stickers, Decals & Unique Automobilia. by Raleigh Cut Text Stickers. 3.75" Pair. Raleigh Oval Style Headstock Sticker. 3". Raleigh 'R' Red & Silver Stickers. 22mm Pair. Raleigh 'Wisp by Raleigh' Stickers. Pair. Raleigh Black & Clear Cut Text Stickers. 8" Pair. Raleigh Centenary Black & Clear Cut Text Stickers. 6.5" Pair. Raleigh Cut Text Stickers. 4.5", 5" or 6" Pair. 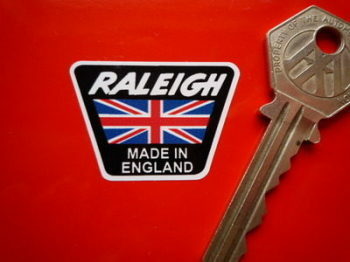 Raleigh Equipe Cut Text Sticker. 3.5". 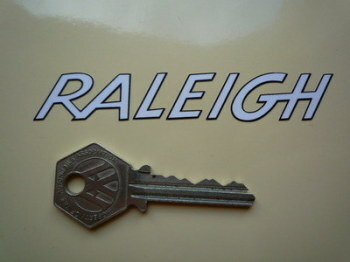 Raleigh Grifter Sticker in Raleigh Style Text. 8". Raleigh Group Product Yellow Oval Sticker. 1.5". Raleigh Headstock Self Adhesive Bicycle Badge. 1.75". 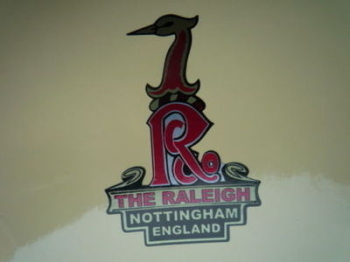 Raleigh Later Style Headstock Sticker. 2". 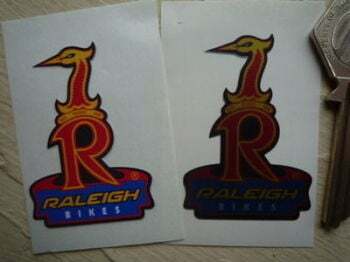 Raleigh Later Style Headstock Stickers. 20mm Pair. Raleigh Limited Edition Black & Clear Cut Text Stickers. 8.5" Pair. Raleigh Old Style Headstock Sticker. 1.75" or 2". Raleigh Old Style Headstock Stickers. 1" Pair. Raleigh Outlined Cut Text Sticker. 4". 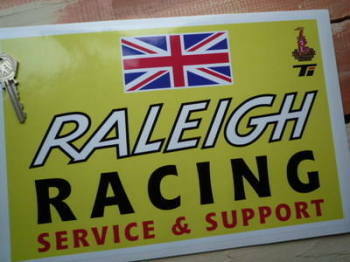 Raleigh Racing Service & Support Oblong Sticker. 12". 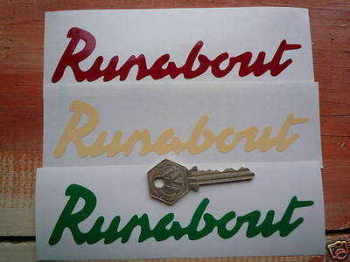 Raleigh Runabout Cut Text Stickers. 6" Pair. 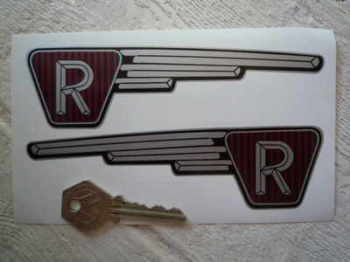 Raleigh Runabout Shaped Handed Stickers. 6" Pair. 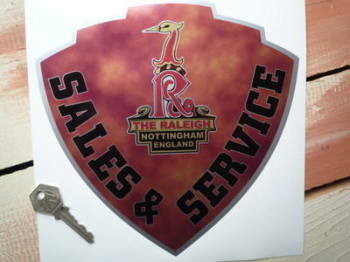 Raleigh Sales & Service Shield Shaped Sticker. 8". 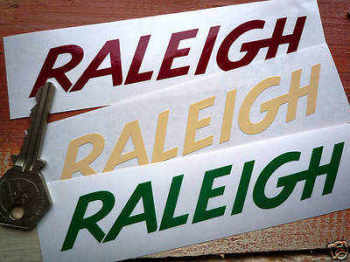 Raleigh Shaded Cut Text Stickers. 5" Pair. 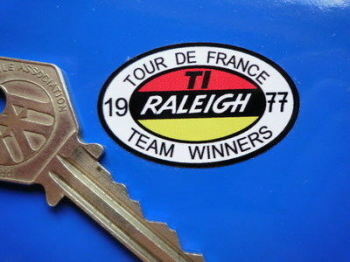 Raleigh Tour De France 1977 Team Winners Sticker. 1.5". Raleigh Trapezoidal Headstock Sticker. 1.5". Raleigh Ultramatic Cut Text Stickers. 6" Pair. 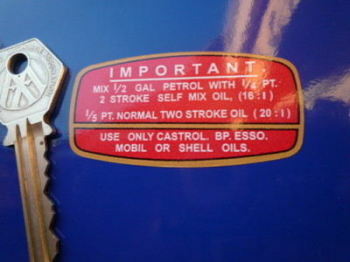 Raleigh Wisp Runabout 2 Stroke Mix Ratios Sticker. 2.5".